What Degree Is Needed to Become a Pastor? If you are considering the possibility of entering ordained Christian ministry, you may be wondering if there is a degree needed to become a pastor. In truth, there is not one consistent answer that can be given to that question, since requirements to become a pastor vary from denomination to denomination. However, there are certain subjects that most if not all Christian pastors should be well versed in, and some typical educational paths and degrees that many pastors-in-training pursue. Many people seeking to become pastors go to seminary to receive the theological training they need. Perhaps the most typical degree needed to become a pastor is the Master of Divinity (M.Div) degree. The M.Div is an academic, professional degree that combines the study of a number of disciplines important for a pastor to learn. These may include theology, biblical studies, biblical languages, pastoral care, church history, and liturgics, among other subjects. 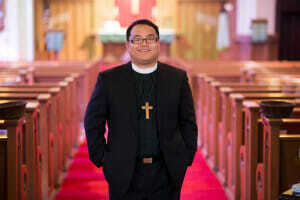 A student must hold a bachelor’s degree to pursue an M.Div, though the bachelor’s degree does not necessarily need to be in any field connected to theology. The M.Div generally takes two-three years to complete as seminary accrediting agencies tend to require 72 academic hours at minimum for the degree. One of the best known accrediting agencies is the Association of Theological Schools (ATS), whose membership is open to both Jewish and Christian graduate schools. Their diversity means that they accredit schools belonging to many major Christian denominations (Protestant, Catholic, Orthodox) as well as schools that consider themselves nondenominational or multidenominational. They accredit schools in both the U.S. and Canada. An M.Div is often, though not always, a prerequisite for becoming ordained in Christian ministry, though it’s important to remember that each denominations has its own process. Some will be more rigorous than others. If you feel called to become a pastor in a given denomination, it can be important to look into the educational and other requirements that your denomination holds. You could start by speaking with a local pastor within that denomination, or by placing a call to your denomination’s regional body (presbytery, diocese or other organization) to ask questions. Many denominations have their own seminaries which they prefer those seeking ordination within their tradition to attend. If it’s a small denomination, there may be only one seminary, but if it’s a larger denomination, you may well have a number of choices. Attending a seminary steeped in your particular church tradition will ensure that you have a background in your denomination’s history and theological development and that you understand how to conduct worship services within that particular tradition. An M.Div degree can also open doorways to other types of Christian leadership roles, beyond that of pastor, including teaching, missionary work, and counseling, though you might need to combine the M.Div with another degree in some cases. If you decide you want to pursue an M.Div, make sure you first speak with your denomination’s governing body to find out if it is indeed the degree needed to become a pastor, or if you need to pursue another educational route.